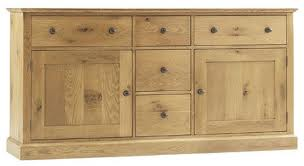 Ok well you may remember from a previous blog I had chosen this sideboard. So even though Andy didn't like it at first, he finally agreed it would compliment the look I was trying to acheive. (Andy has slightly more modern tendencies than me) we decide to buy it and lo and behold it's not made anymore. I spent half a day on the net to no avail :-( desperate to find somewhere that still could get it. However my two lamps arrived and I love them.Thanks to desresdesign they are gorgeous. in the lounge I would love to paint all the wood, skirting door frames etc in fb french grey and the walls in fb old white with 2 walls being james white, the colour varies so much with the light and then I came across this blog which explained it all perfectly and I have made my mind up to go with those colours. We have decided more or less on the sofa and have had some colour swatches from sofas and stuff and they have been narrowed down to two. So we need to get the wooden floor laid and get everything ordered. Ordering furniture in itself is a huge challenge living in the highlands and the quotes for delivery vary immensely from 40 to several hundred pound ! Ok so watch this space to see if I can persuade Andy he thinks painting oak furniture is sacrilege, what are your thoughts on painting wood ? I just found your blog via a link on another (Life at Golden Pines). We have this same discussion at our house ... painted vs. unpainted wood. There are many furniture pieces that benefit greatly from a coat of the right color paint, to accentuate their lines and contours and fit them into a decorating scheme at home. Others, like the cherry hutch or antique pine pew in our dining room stand alone with their wood finish ... painting things like these would be sinful. 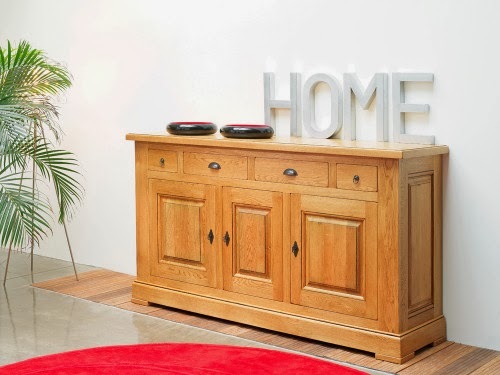 Of the two sideboard examples you offer, I instantly was drawn to the second, more simple one. This had nothing to do with its painted finish. It should appeal to Andy's modern side more than the first one, with its traditional, raised panel styling. Now I'm off to read more of what you have here. Lovely to 'meet' you! I prefer the second one because the drawers on the top are deeper. Shallow drawers just don't hold enough things. Good luck on convincing Andy to paint the furniture. 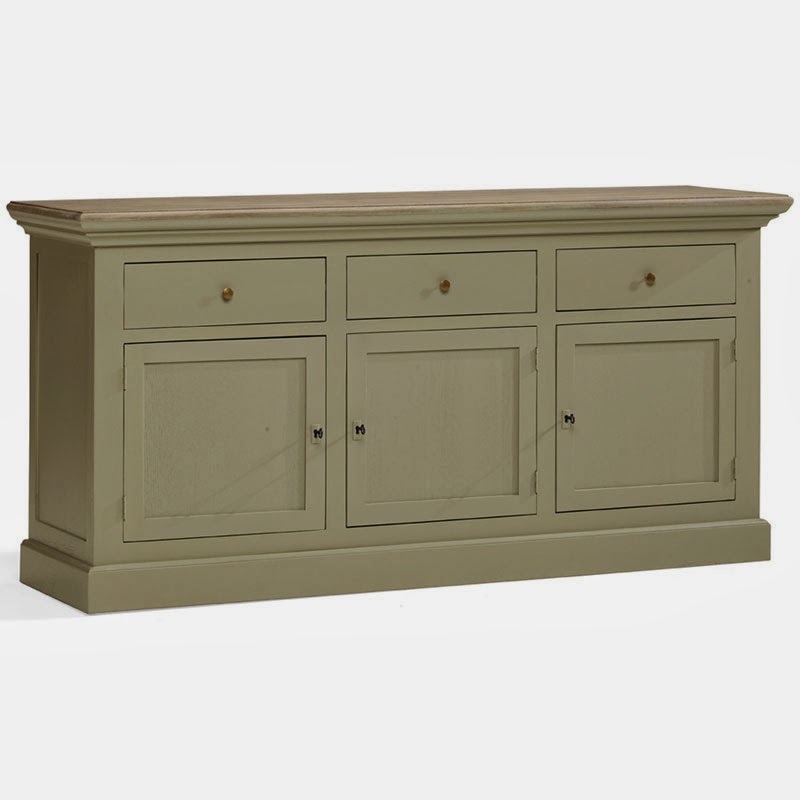 I prefer the last one - it looks more robust and balanced with the drawers directly above the doors, and the paint colour is lovely. Painting oak is a real shame, but any other wood-fine. I do like the painted look. Love those lamps-so glad you got them. 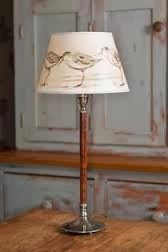 I love my lamps too, so just waiting to choose a sideboard to put them on ! I also like the painted one.